Firstly, exciting news for the young age groups. The club has registered to be an England and Wales Cricket Board (ECB) All Stars centre. 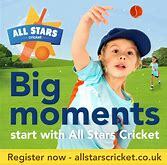 All Stars Cricket is the ECB’s entry level participation programme, aimed at providing children aged five to eight with a great first experience in cricket. The fee is £40, £35 of which goes to the ECB for providing personal kit and equipment to the club. The club receives the other £5. Early registration is advised as part of the deal is that personalised T-Shirt and equipment will be delivered to your address. Note: you can only join up by the online registration using the link above. If your child is in year 3 and wishes to do the kwik cricket (see below) then please sign up via the membership form, if in doubt please contact me. 1. Registration Evening - Friday 5th April - 19:00 - 20:30 in the Clubhouse. A membership form is attached to enable you to print off and complete in advance. 2. If you are unable to attend on the 6th then I’m happy to accept a scan of the document to this email address together with a BACS payment - details are on the form. 3. Weekly Coaching begins on Friday 26th April. As per last season we are offering a session with the TOTS (under 5), The New All Stars, u 9, 11 and 13, starting at 18:30. The age limit for the TOTS group is 2 ½ years old as at 1st April 2018. The season runs for 13 weeks and ends on Friday 19th July. The All Star programme officially starts on Friday 10th May, however for the 26th April and 3rd May we will run the group as an introduction. 4. If you wish to purchase a Club shirt, these will be available to order on the 5th and cost £15 each. However, please note that All Star children will be provided with coloured T-Shirts as part of their registration fee. 5. The u11's will play their matches on Sunday mornings, the u13's will be on Thursday evenings for away games and either a Tuesday or Thursday for home matches. 6. The u15's group at present have no arranged matches, the numbers look to be low. As per last season Craig Atlas will run a net session on Friday evenings, starting at 7:30 - 8:30 after the other age groups have finished. After three weeks we should be able to gauge the numbers and strength of the group and hopefully then start to arrange a few matches against some local teams. This would probably be 8 a-side pairs. The club is keen to give this group some cricket as in 2020 the group numbers will, in theory, rise with the number of u13's moving up. 7. For the u9 group we have entered a Kwik Cricket Competition and will be playing against local teams. Finally, at our recent junior meeting a discussion was held about ‘helping’. This year we require some help in our coaching team and we discussed at the meeting how we could manage this situation. We have again included a box, on the membership form, so that parents can nominate one date to help on a Friday evening. This could be helping the coach during the session, set up and clear away after the session, take the attendance register etc. Always lots of things to do. It can be help for the group that your child is in. If you would like to help on a regular basis that is fine as well, please see me. We would welcome children who want to gain experience for their DOE award, this has proved successful previously and we would like to continue with this initiative.